This tour has something for everyone. History buffs will be intrigued by Havana, Trinidad and Cienfuegos – all centres that were part of the hub of wealth and commerce during colonial times. For those enjoying nature and the outdoors, we stay in a mountainous biosphere reserve, the tobacco region of Viñales with its stunning landscape, and in a quiet resort overlooking the Caribbean. In addition to these extraordinary locations, we will take you to meet farmers, artists, naturalists and ordinary people doing extraordinary things for their communities. As with all of our tours, it is rich in content and value, while at the same time slowing down the pace often spending 2 or 3 nights in each area. Don’t like early morning starts? We never start our day before 9:00 am unless it is absolutely necessary. It’s your vacation! Take a guided walking tour through a tobacco field in Viñales, visit the tobacco drying house of a local farmer. In order to make each tour, a special experience space is limited to 20 people. We encourage you to book early to avoid disappointment and for the best airfares. Flights: Call us for flight and airfare information from your closest airport in Canada as we can often access flights not easily found on the Internet and offer alternatives. Not included: Travel insurance, airfare and gratuities. Singles wishing to share: We often get requests for single travelers wishing to share accommodation. If you are interested in traveling with a companion please let us know and we can try to match you up with a suitable traveling partner. Insurance: Medical insurance is mandatory in order to enter Cuba. Cancellation and trip interruption insurance is optional. Premiums depend on your age, the length of time away and the cost of your tour and insurance will be discussed and quoted at the time of booking. Tour Deposit: $300.00 per person. Forms of Payment: Cheque, Visa and Master Card or email. Payments made by credit card are subject to a 3 percent processing fee. For information regarding e-mail, payments contact your financial institution. It is easy and convenient. 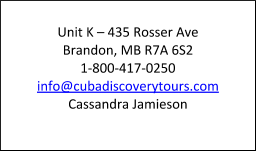 Cancellation Policy: In the event that you have to cancel you must notify Discovery Tours immediately in writing. The following scale of charges will apply according to the date that notice is received. Airfare penalties may differ and will be discussed at the time of ticket purchase. Today is spent in and around the self sustained community of Las Terrazas – a lovely, isolated village built on mountain terraces that were formed and re-forested after the indiscriminate cutting of trees in earlier decades. A local guide explains the history of the area and why this model community was developed. A walk throughout the town includes a stop at a local artist’s homes and small ventures that have made it possible for those living here to enjoy a livelihood not readily available in other parts of the country. An intriguing stop is the historic Buena Vista Coffee Plantation originally constructed in 1801, and now beautifully restored. You will see how coffee beans were dried, the owner’s hacienda, and the remains of the slaves living quarters. In the afternoon we take a short drive to a tranquil setting beside the picturesque cascades of the San Juan River – Los Baños de San Juan -where you will have the opportunity to swim in the natural pools. This is an area frequented by Cuban families on weekends and away from the usual tourist crowds. This morning we visit to the “Orquideario” or Orchid Gardens located next to our resort. The humid microclimate here makes it possible for more than 700 species of various trees and plants to flourish – many of which the local guide will point out. The original home of the garden’s creator is perched near the top of the hillside and the view of the surrounding valley from the terrace is spectacular. We will visit a local educational facility to meet some of its students and spend interactive time with them. The afternoon is free to further enjoy this tranquil area. Perhaps take a hike to the waterfalls, see the remains of the former summer homes of those who spent their leisure time here in bygone eras, or relax by the pool. Cuba is known for its artists, sculptors and painters and in fact Cuban art is growing in demand and value on the global market. Today you have the unique opportunity to visit an Artist’s Antique Restoration Cooperative which has established itself as a self supporting enterprise – something not very common in Cuba. It consists of more than 50 professional artists who preserve the traditional way of reproducing and repairing works of art including marble sculptures, paintings, carvings and stunning frescos. Their work can be found throughout Cuba and some pieces have been requisitioned internationally as well. We will also visit a local artist, who has a tiny workshop inside his home and teaches painting to the children of the community. Time to get creative; this is your chance to show off your painting skills. Tonight you may want to visit the local Trova House where local musicians and professional dancers provide entertainment. Viñales Valley is one of the most scenic and extraordinary areas in Cuba, and has been named a UNESCO World Heritage Site. During the Jurassic period the earth’s crust dropped and what didn’t fall to the “floor”, which is now the valley, remained as rounded limestone outcroppings called “mogotes”. These strange outcroppings are laced with caves, and during a boat ride on a subterranean river within a mogote you will see stunning formations of stalagmites and stalactites. This area is also one of the best tobacco growing areas in Cuba and you will see tobacco farmers patiently plowing their plots of land with oxen. We will take a guided walk through tobacco fields, stopping at the home of a tobacco farmer and see his “drying house” where the tobacco leaves are hung to cure. You will learn first-hand about the labour intensive process from planting to harvesting tobacco. Our day also includes an “organoponico” or organic farm. After the collapse of the Soviet Union, Cuba found itself quite suddenly without oil for power, gasoline for equipment, and fertilizer for crops. For the first time in decades there was malnutrition and hunger throughout the country. As there was no efficient way to move the food that was produced from the countryside to cities, urban gardens were developed. These were large vegetable gardens grown without chemical fertilizer, and located within towns and cities. Cubans, traditionally meat eaters, had to develop a taste for vegetables. During our visit we will learn about the advances that have been made in this field and enjoy a wonderful meal prepared for us using the fresh produce they grow. The balance of the day is free to further explore this small community. Havana bound! There is no other city in the Caribbean that is as captivating as Havana and that’s why we include a three night stay in this amazing city. During the 1950’s it had more millionaires than any other country south of the United States, and one’s imagination starts to wander when you see the mansions built during that period. The Mafia history only serves to add to the intrigue. Colonial Old Havana or “La Habana Vieja” is a living museum and UNESCO World Heritage Site. This compact area is replete with museums, dining choices and music venues – and also the most densely populated area in the city. The mix of families carrying on their livelihood and uniformed school children on their way to and from school add to the unique atmosphere found in the “old city”. We will visit Sloppy Joe’s Bar – a local hangout during the 1950’s which made the original “Sloppy Joe” sandwich famous. After being closed for almost 50 years the building was renovated and re-opened in 2013. Tonight’s included dinner is at a Paladar. A walking tour of Old Havana reveals the rich history of the area with its many mythical figures and amazing combination of various styles of architecture as we visit the four primary colonial squares – Plaza de Armas, Plaza Catedral, Plaza Vieja and Plaza San Francisco. You will see how this historic centre is being restored one building at a time. The afternoon is free to further explore on your own. Getting “lost” in Old Havana and wandering throughout the maze of streets is a wonderful way to discover more hidden treasures. Today we board our motor coach to travel to “Modern Havana”, the part of the city which was developed during the 1940’s and 50’s when the United States and Mafia dominated Havana, and Batista served as a convenient president to keep the country in check. You will see mansions from this period – some restored and others which have fallen into disrepair but are still inhabited by multiple families. We will stop at the Hotel Nacional where the famous meeting between the Mafia bosses was held in 1946 and plans were made to turn Havana into “the Las Vegas of Cuba”. In the bar are photos of famous people who have stayed there over the decades. Recently added is the top of one of the original gambling tables – most of which were destroyed following the Castro revolution when all of the casinos were closed down. We tour the opulent Necropolis Cristobal Colon (Columbus Cemetery) which is considered a national monument and has been described as “an exercise in pious excesses”. We will drive by the Havana University where Fidel Castro was educated, and the Canadian Embassy. Another quirky place we will visit today is Parque John Lennon – where a life sized statue of the famous Beatle sits on a park bench. You can join him for a souvenir photo! Tonight you might want to attend a cabaret, the ballet, or jazz club. Havana has a plethora of options! 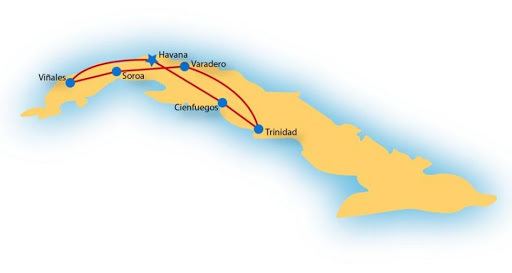 Today we leave Havana for and travel to the Caribbean seaside beach area close to Cienfuegos. The colonial city of Cienfuegos has both French and Spanish influences and our stop include the stunning Palacio de Valle with its spectacular ornate carvings and a Mughal style of architecture, and the Teatro Tomas Terry (theater). Following some free time to familiarize yourself with the plaza area and pedestrian walkway (prado), we travel out of the city to our quiet seaside hotel overlooking the Caribbean Sea. Beach Day! Today is yours to relax and enjoy the Caribbean. Perhaps there will be a baseball game in town for those interested or a performance at the theatre. Your guide can make arrangements for you to attend. Today we step back in time when we arrive in Trinidad and explore the cobble stoned streets which remain as they were in the 16th century. This open air museum of Spanish colonial architecture was named a UNESCO World Heritage Site in 1988. To enable us to fully appreciate the history of this era we will visit the Historical Museum of Trinidad. The collections include artefacts of the indigenous people, the slave trade and the boom of the sugar cane industry. The independence wars and other significant moments of culture, society and economy of Trinidad are covered. The afternoon is free to further explore Trinidad. Perhaps you would be interested in an optional percussion or salsa lesson? It’s fun for all and many have found a musical talent they weren’t aware of previously! This morning we climb aboard a former Soviet army truck and wind our way into the Escambray Mountains, and then continue on foot on a scenic hiking trail through this coffee growing region. The local guide will point out the flora and fauna, and you will have the opportunity to swim in a natural pool under a spectacular waterfall. We are rewarded with a lunch in an open air restaurant nestled between the mountains. Today we travel to Varadero making a stop at the former Dupont summer home – the “Xanadú Mansion” designed and built in 1927. Varadero was the playground for the rich and famous in the 1940’s and 50’s before the homes and hotels were taken over by the Cuba Castro government following the 1959 revolution. You will have some free time before our farewell dinner at a local paladar this evening. Today transfer to the airport for your flight home, or perhaps you have have chosen to extend your stay in Cuba.